Sub: Seventh Central Pay Commissions recommendations - revision of pay scales - amendment of Service Rules/Recruitment Rules. 2. 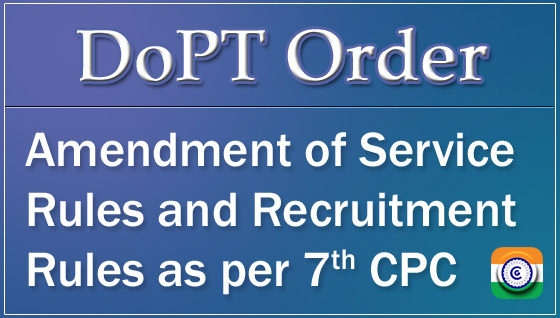 In the light of above all cadre controlling authorities of Organized Group A services are hereby requested to amend the SRs as per OM dated 30.08.2016 to bring them in-conformity with 7th CPC structure. The information in this regard may also be furnished to the undersigned latest by 31st July 2018 in the format enclosed. 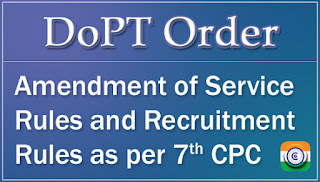 Sub: Direct recruitment from open market in Level-1 (7th CPC pay matrix) - Procedure-regarding. - In modification of above, the number of candidates to be called for PET should now be 03 (three) times the number notified vacancies. - In modification of above, henceforth, the number of candidates to be called for DV shall be twice the number of notified vacancies. - In modification of the above, it has been decided that the panel will now be formed to the extent of the notified vacancies with a standby panel of 50% of the notified vacancies. In case the main panel plus stand-by is also exhausted and still there is a shortfall vis-a-vis notified vacancies, the recruiting agency may further go down in the list of candidates which meet the requirement of minimum qualifying marks in their respective community for conducting PET (if needed) and DV/ME to the extent of shortfall community-wise. This may be done till the demand from the concerned Railway administration w.r.t. indent placed and vacancies notified are fully met. These provisions shall be subject to currency of the panel. Subject :- Standard Terms and Conditions for 2017 IDA pay scales in respect of Board level executives of CPSEs - reg.